The former Adobo Grill building at 1610 N. Wells St. has been cleared for demolition. OLD TOWN — The building that once provided the distinctive entryway to Piper's Alley has been cleared for demolition. The owner filed for a demolition permit last month for 1610 N. Wells St., previous home of Adobo Grill, which suffered a horrendous grease fire in August 2015 that also threatened Second City and damaged its offices. Yet because the building was rated "orange," the second-highest ranking on a city scale used to determine if it's worthy of landmark status, the permit was held for up to 90 days to allow preservationists and other community interests to weigh in. City inspectors decided that wasn't necessary this week, ruling, "The building is fire-damaged and structurally unstable." They removed the hold on the demolition permit. No known demolition date has been set, and John Brady, an attorney for owner Thomas Tully who filed for the permit, did not respond to requests for comment. 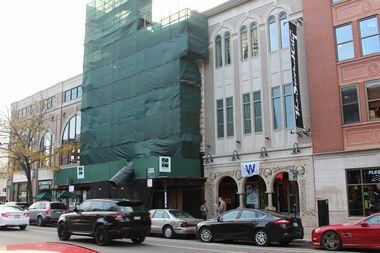 Ward Miller, executive director of Preservation Chicago, said earlier this week that the original facade, with its bay windows and witch-hat turret, was worthy of retention. At worst, he said, he hoped the building would be "reconstructed to look as it did before the fire." Miller was more resigned Friday. "It's come down to a public-safety issue, and we don't want to put people at hazard," he said. Yet he repeated his call to "dismantle the building and try to reinstate as much as possible" of the original facade. Peter Strazzabosco, spokesman for the Department of Planning and Development, said, "It’s staff’s understanding that portions of the original facade will be included in the replacement structure." The building dates almost to the Great Chicago Fire of 1871 and was home to Piper's Bakery, an original Old Town fixture. Later, it became the entryway to Piper's Alley, a collection of oddball stores and attractions including Ripley's Believe It or Not and the London Wax Museum, as well as head shops and poster stores, that was a hippie haven in its heyday in the '60s and '70s. The permit application specifically mentioned "demolition and removal of the front projecting bays," but also "construction of a new fourth-floor addition," which could be read as a bad sign for the turret top.